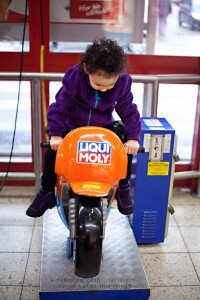 Lately Mya has been all about little rides that go and this one was no exception – but she couldn’t figure out how to start it! Don’t worry, I helped out my little driver! 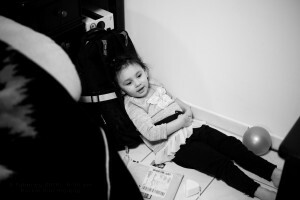 Mya is obsessed with playing with Daddy’s backpack – he isn’t all too thrilled with the prospect of her squishing everything in it – but alas, it’s like moths to a flame. This time, she wanted to lean back on it and “buckle up” like she was in a car! I love her imagination. What do you eat when you are dehydrated? 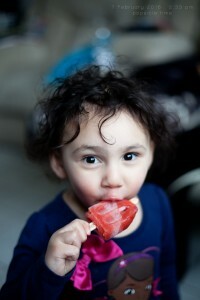 Popsicle’s of course! Mya was just being generally goofy and wanted to play around w Mama’s foot – so I tickled her with it, and the games begun! All while holding onto her coloring book! 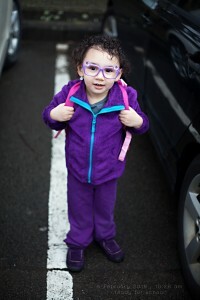 Headed to school and feeling all better, a week later! She decided she had to sport the Doc glasses as she has dubbed them. They were sunglasses for like 2 mins, she promptly decided she didn’t want them for that and she wanted “glasses” so she poked out the lens and threw them away herself!